Nourish your hair naturally with olive oil. If you have dry hair you may be wondering, is olive oil good for hair? In fact, olive oil has many uses, though most are purely culinary. Celebrated amongst world class chefs and Grecian goddesses, olive oil and other plant oils has also long been touted in the beauty industry for its ultra moisturizing and replenishing properties. Olive oil is rich with natural fats, making it perfect for nourishing dry and chapped skin organically. In addition to its ability to help lower cholesterol, promote heart health, and add suppleness to the skin, olive oil is a naturally pampering and nourishing hair treatment. When shampoos and heated styling tools begin to take their toll on hair, lovely locks can quickly turn ragged and dry. Damaged hair needs to be rebuilt from the inner hair shaft, so curing damaged hair takes both time and plenty of pampering. Hot oil treatments and a great way to lock in added moisture, increasing shine, body, and bounce. While many over the counter hair oils can be purchased and worked into a hair masque, natural hair products and ingredients treat hair with little additives, keeping the repair process pure and simple. Olive oil is a natural ingredient perfect for dry hair and heated oil treatments. If your hair screams for a little TLC, whip up a warm masque following the instructions below, and sit back and reap the benefits. In a microwave safe bowl, heat one quarter cup of olive oil for up to one minute. Be careful handling oil, it may be hot! Gently pour olive oil over the hair while in the bathtub or shower. Work oil from scalp to ends and comb through with a wide tooth comb. Pin hair up onto top of head and wrap in a terrycloth towel or shower cap. Relax and let olive oil soak for a maximum of thirty minutes. After allowing treatment time to penetrate, rinse hair thoroughly. Apply two applications of shampoo and work well into hair. Follow with light conditioner for detangling and sheen. There's no need to splurge on expensive finishing serums to get the shiny hair results you crave. Rather than buy several shine, smoothing, or anti-frizz treatments, invest a few dollars into a bottle of olive oil and use the multi-purpose oil as a finishing gloss as well as a richening mask. A little dollop of oil worked into the palm of you hands and smoothed over the dry ends of hair will disguise flyaways and help glisten the cuticle layer. Another way to incorporate the rich benefits of olive oil into your hair is through scalp massage. Scalp massage not only stimulates root growth, promoting activity and increased circulation, it also helps distribute the scalp's natural oils through the shaft of the hair, increasing moisture content. 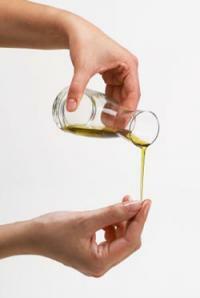 Help your scalp out and work olive oil into your palms and saturate the hair as you relax. A little dose of oil will have a major impact on the health and sheen of your hair. There are three type of olive oil: virgin, extra virgin, and pure. These types are based on the olive's first, second, and third press to excrete oil. The first press is extra virgin olive oil, and is generally the tastiest and most expensive. For hair treatments, pure olive oil will do the trick. 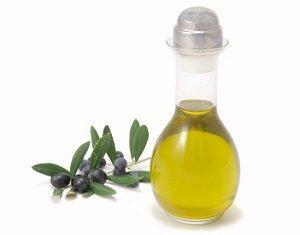 When storing olive oil, keep it in the original container (canned olive oil is best) and use within six months. Store oil in a cool dark place, such as a bathroom cabinet or pantry. For many hair uses, olive oil and the ultra-pampering fats found in a simple bottle are a soothing and moisturizing alternative to lab created conditioners. While olive oil may always reign in the kitchen cupboards, for hair and beauty rituals, olive oil is probably the best kept beauty secret. Is olive oil good for hair? You bet!